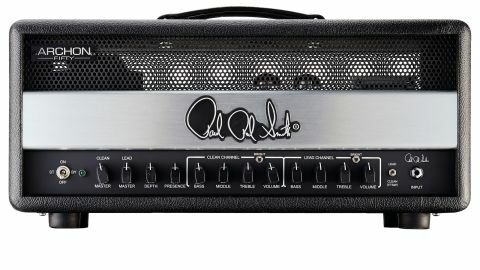 A PRS amp that's worthy of the name? We think so: powerful and portable with superb clean and rock tones. Quality build - there's a lot of hand-wiring and soldering. Fully road-worthy. Superb modern lead voice. As always with PRS, the expense. With the arrival of the Archon amps, PRS finally appears to have a backline product that could well become just as coveted as its guitars. Back in November of last year, we looked at the Archon 100 head. Now, it's time to introduce the Archon 50, which is available in head and combo format. "There's a lot of hand wiring and soldering, which is all very neat, clean and consistent"
The Archon 50 head swaps the flamed maple fascia of the 100-watter for a brushed aluminium trim with a matching silver logo. Inside the aluminium chassis, these Archon has heavy-duty PCB strips - emulating a turret-board-style of layout - with a chassis-mounted valve base and hand-wired front- and rear-panel components. This robust construction keeps the heat of the valves away from the circuit boards and should add considerably to the Archon's long-term reliability. It also means there's a lot of hand wiring and soldering, which is all very neat, clean and consistent - that's quite important, because wiring changes can have a profound effect on performance. There's a single input jack feeding two independent channels featuring separate gain controls, bright switches and three-band EQs. The individual master volume controls for the clean and overdrive channels are joined by presence and depth controls to fine-tune the output stage response. Around the back, there are sockets for the footswitchable effects loop, external speaker outlets with an impedance switch, a half- power switch and bias test points. The impedance switch is a standard toggle - we'd prefer to see a screwdriver type that can't be accidentally changed quite so easily. Oversized transformers and quality Ruby Tubes valves complete the picture. The head comes with 6L6s as standard and can be re-biased for EL34's. Overall, it's an amp that would sit comfortably on the professional stage alongside PRS's guitars. As usual, we test the Archon with a range of different guitars, including an old Strat, a Fender Custom Shop Nocaster, an early 70s Les Paul Custom and a PAF-loaded Les Paul Standard, together with a selection of 4x12 and 2x12 cabs. There's a high-headroom clean channel that can be pushed into distortion, although it works best at lower gain settings, providing a tight, fast bass response, balanced mids and a bright but not ear-piercing treble. "It has a superb modern lead voice, with rounded mids and a warm treble that retains just enough bite"
The bright switch adds a little top-end sparkle, which is handy for guitars with higher-output pickups. It's an airy open tone, not quite the syrupy sweetness of a classic 'blackface', but great with a touch of chorus and delay. In contrast, the Archon's lead channel has a superb modern lead voice, with rounded mids and a warm treble that retains just enough bite for those 'off the pick' pinched harmonics. There's a lot of drive on this channel, too. Players looking for mild overdrive effects might be disappointed, but for full-on in-your-face lead and crunch rhythm, it's easy to see why the Archon is beginning to take over as the amp of choice for many modern rockers and metal players. Even standard single coils can really sing, but to unleash the full fury of this channel, a hot humbucker is what's needed. Then the Archon really sings with a fluid response that almost plays the notes for you. The footswitchable fixed-level effects loop works well with modulation and delay effects. Another method that adds considerable versatility is to use a graphic EQ with the mids dipped out then switching the loop in for rhythm on the lead channel and taking it out for leads. Adding a touch of short delay-time reverb also helps magnify the Archon's fast bass response, and sounds great for choppy rhythm playing. The 50-watt output stage has plenty of power to spare and will easily overpower most drummers in an unmic'd gig situation. Being Paul Reed Smith amplifiers, you'd expect a premium price. It has to be said that this Archon isn't cheap by any stretch of the imagination, but considering the quality of what's on offer compared to the competition, we'd say the price is quite reasonable - this is a serious pro-standard amp that is made to handle life on the road, as well as look smart in your home studio.